Voters stand to be counted Wednesday night on new school question. The standing vote was 319 to 99, easily gaining a needed two-thirds majority to pass. The school question still needs approval in the ballot box on April 24, when voters will be asked to exclude the debt from the Proposition 2 1/2 state tax cap. A simple majority vote is needed. If it is approved, the town will qualify for state reimbursement of about $14.6 million, leaving town taxpayers responsible for about $32 million. 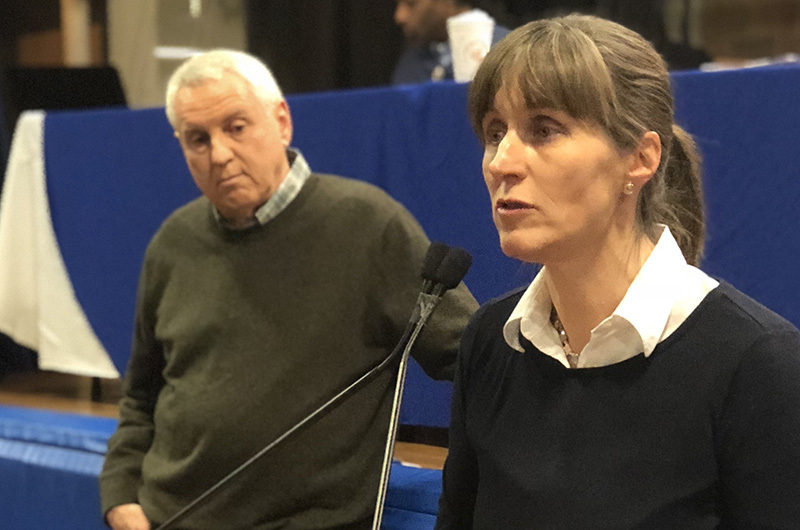 On Wednesday school administrators, teachers, planners and supporters rejoiced in the vote that capped more than two years of planning and public discussion over the new school. Planning for the project has taken place under the umbrella of the Massachusetts School Building Authority. “It’s very exciting,” Vineyard schools superintendent Matthew D’Andrea said. He praised the work and dedication of the school building committee, which has been led by Colleen McAndrews. Speaking on the town meeting floor Wednesday night, Ms. McAndrews had one primary message. 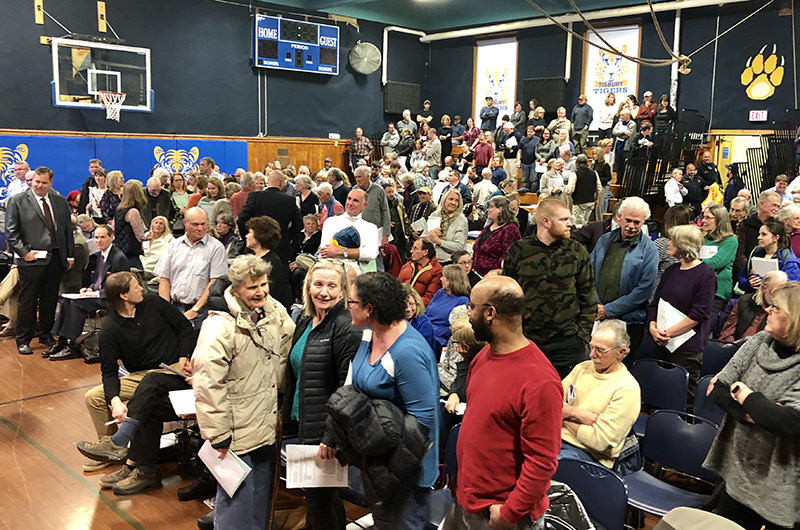 A single item on the 40-article annual town meeting warrant, the school spending article dominated the first two nights of the annual town meeting. The meeting reconvened for a third night on Thursday. Moderator Deborah Medders presided; an overflow crowd of 407 voters attended on the first night, while 424 voters turned out on the second night. On Tuesday night debate on the school question was peppered with skepticism. 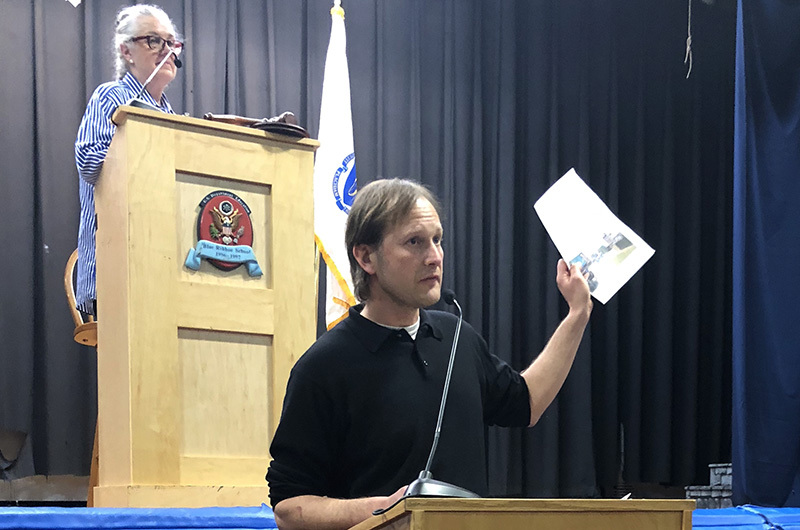 In a lengthy speech, planning board chairman Ben Robinson questioned the decision to build a new school on the existing site, arguing that renovation would be better for the town and the environment, and suggesting that the school building committee had not adequately vetted that option. “It is clear in my mind that the new construction option accomplishes very little to benefit our future, nor the education of our students,” Mr. Robinson said. For some voters the hit to the town tax rate from the largest capital spending project in recent memory was the biggest sticking point. Selectman Tristan Israel also spoke against the school article. He pointed to the growing population of elderly residents as a pressing need for the town. “We have other interests and needs in the community that we need to support,” he said. But on Wednesday night supporters of the new school turned out in force to weigh in. Long lines formed at every microphone in the school gymnasium where the meeting was held. Wiet Bacheller, a longtime town resident and retired teacher, compared the decision to the one made by the town in 1929 when the existing brick school was built. “Tonight we are faced with having to make a similar decision,” she said, drawing applause. John Sundman, whose three children attended the school, pointed to future generations. “The world that they’re going to be inheriting is really different from the world we grew up in,” he said. Rick Brew called the decision a middle ground. “This is a compromise choice,” he said, announcing that he would vote yes. Voters had agreed to end debate by 9:30 p.m. — and the long-anticipated school question came to a standing vote. 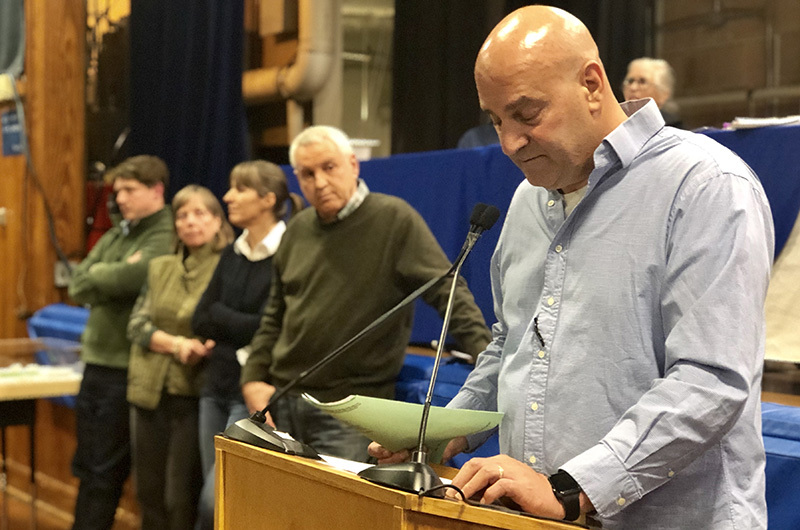 The town selectmen were on the record as being divided, with Mr. Israel voting against and selectman Larry Gomez voting in favor of the new school. Selectman Melinda Loberg remained in her seat, abstaining from the vote altogether. 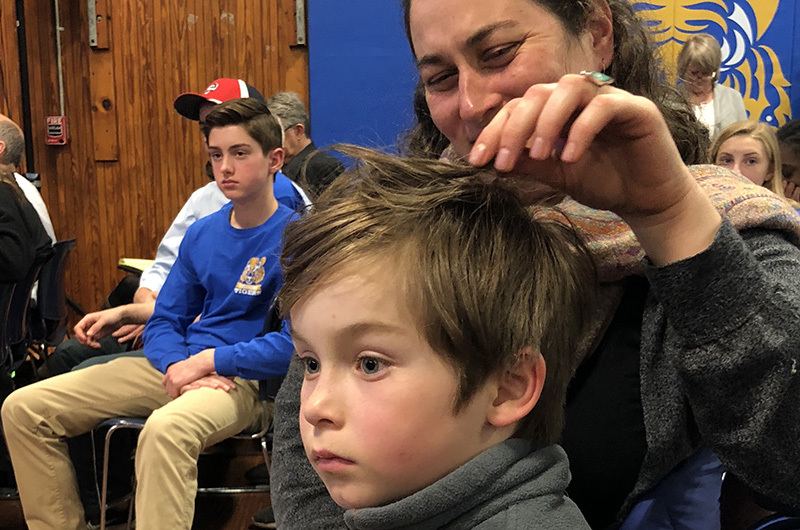 School principal John Custer, who attended the meeting with his father Herb Custer, former superintendent of Vineyard schools, expressed gratitude at voter support for the town school and also cautious optimism about the final outcome. In other business Wednesday, voters approved a $27.9 million annual budget after a 30-minute discussion examining line items. There was prolonged discussion about whether to contribute $9,165 to the county substance use prevention program. Mr. Kristal spoke on behalf of the finance committee, which did not recommend the article. “We find duplication of effort from other providers or other funding sources,” he said. In the end the article passed on a voice vote. On Tuesday night, voters made their way through a special town meeting warrant, approving all articles except one regulating rentals. That article was put on hold in light of a bill on Beacon Hill to regulate short-term rentals that could become law. A home rule petition that would give the town more ability to regulate herbicide spraying was approved after discussion and multiple amendments. The petition will now go to the state legislature. For the past two years Tisbury has opposed a program by the utility giant Eversource to spray beneath power lines, to no avail. The home rule petition is aimed at giving the town more control in the matter. “We owe it to ourselves to our children and to our aquifer to keep trying,” Mr. Israel said. Voters also approved a petition from Island students to ban the intentional release of helium balloons, agreed to establish a sewer district along the State Road business corridor and to establish a stabilization fund that pertains to upgrades the wastewater treatment plant. The meeting continued Thursday night. The annual town election is April 24. More photos from Tisbury town meeting. It amazes me that a question worth $46 million is voted by a raise of hands. The bulk of the town tax payers are not being represented yet we are asking them to carry the burden. My question is what is wrong with the massive brick school we have? The footprint of that school allows for a sizable addition at much less cost. I have a home in VH and according to the numbers given, I will end up paying $14,000 more for property taxes over then 20 years proposed. That’s nuts considering I have no kids. This seems to be poorly thought out a serious waste of money. I want someone to tell me why this is so necessary! That 14 million will only cover the interest. The taxpayers will cover 43 million. IT isn't necessary. If you are a registered voter in Tisbury, vote NO on April 24. If you are not registered to vote in Tisbury, prevail upon your friends who are to go to the polls and vote NO. You certaily are not the only one who is very displeased by the outcome of this vote. The funny thing was to see the school boosters stampede out of the gym as soon as their article had been voted on. This evening there were exactly 103 voters in attendance. Barely enough for a quorum. I am a registered voter in VH and I only own one home and it’s here! I did go to a school when I was you and it was half the size of the school they have now. No fancy computers or massive gymnasium. I will be voting NO on this major waste of tax money. I own a home values around $600k so my tax yearly will increase nearly $750 based on the numbers provided! That’s insane. Beware voters, unless you are rolling in cash vote no on this project. The school can be added on to if the kids are so in need of more space. They can also go to the charter school! The vote for the new school happened in the same manner all large municipal projects are voted in. Single issue voters show up. Yes, they show up and vote. It is how the police station, fire station, senior center, and library all got on the ballot, where they could be voted on. That is Democracy. I hope that all those who showed up to vote yes at the Tisbury Town Meeting show up at the ballot and vote yes. The time is now with AA+ rating, low interest rates, and a run down school, there may not be a better time to vote, YES! YES! YES! It is time for a NEW SCHOOL. Tisbury Mom: The town of Tisbury spends a huge portion of its budget to educate its children. Well over 50%. Which do you prefer, a brand-new building, or decent teachers, and plenty of them? Because the Town cannot afford both: a 4:1 teacher ratio plus a new school. There are other people in the Town of Tisbury with claims on the town's limited resources. The more I hear from the teachers and parents, the more I hear an attitude of ENTITLEMENT and Me-Me-Me, dressed up in "virtue signaling." Civics lesson - the town meeting vote did not decide to build an new school it only allowed the question to be put to ALL THE VOTERS on the ballot. your question about adding onto the school was addressed and discussed at open meetings over the last several years, your elected officials had great input on this process, they made their leadership skills abuntly clear at the vote on town floor- after recommending the school committe apply for the MSBA loan and having their hand in the design process only Mr Gomez stayed true to his word and voted for the school, mr Israel voted against the plan he helped come up with. And selectman Loberg showed the all in town what lousy leader she is by punting with an abstention on the biggest vote of the year As to paying for the school even though you have no kids guess what that's how society works - someone paid for your education - and if you think the price of education is important try the cost of ignorance- the youth of our town are our greatest asset they carry the future of our town country and world - after all if we don't take care of the youth who will take care of us when we are old. Mrs Dogwood, Where are the plans for the the renovation & addition for the existing school? Where can we find the receipts that will show that the committee drew up plans and budgets for this scenario? Thats what the $875,000 included right? Or did it all go to this hot mess of a building with non operable windows? Assessed value of a low cost house 500,000 dollars,X 108,000 dollars per 1,000= 540 per year min. times 20 years 10,800 dollars more in taxes per household ! Plus you have to furnish and maintain it dig deep folks ! sorry i meant $108.00 Per 1000 . If the committee genuinely made the effort to examine a remodel of the existing school where where are the plans? Why were we not given the numbers along side this truly ugly monstrosity that was given? Can we see the bills for the $875,000 that was paid out for this study? Why as voters do we need to take whats offered? Why cant we say, great the state will give you x dollars to build a new school, and we the voters will match that with x dollars? Im still voting NO, none of your appeals swayed me, and I believe your group should check in with the town of Chilmark and the constant problems their new school has, leaky roof, non working hvac systems, poor grading during construction so its always flooded in the front.......be careful what you wish for. Another absolutely stupid decision brought to you by Martha's Vineyard. Utterly ridiculous costly and unnecessary. If you want huge giant buildings with state-of-the-art everything, move to Boston. Why do you even live on Martha's Vineyard if you want Martha's Vineyard to become like everyplace else? Ridiculous. Most people I know share the same common sense as Emily, and enjoy life far away from spendthrift suburbanites. Sensibility says it’s time to do what’s necessary to make the existing school dependable and safe. I just hope that Tisbury’s silent majority shows up on April 24th to reject this boondoggle... less than 10% of registered voters voted yes at town meeting... FIFTY MILLION?? C’mon. Please. Stop it. I would love to know how class sizes justify this. Are we paying for present need, or in anticipation of speculated future growth. I would also like to know what percentage of properties in Tisbury are owned by people for whom the property is a second home. My conservative guess it’s on the order of 70%. So 70% of us are carrying the burden for an extravagant new building being used by 30%. It’s easy to spend big money when most isn’t yours. Then, those who’s children do use the school will get a homestead exemption that isn’t mandated by the state while those of us who won’t be using it pay the full taxes. What happened to the New England fiscal conservatism? Tisbury has been on a spending spree using largely other people’s money - new police station, new fire station, now this. 200 years ago we had the Boston Tea Party over taxation without representation. State law allows non-domiciliarios (MV is not the primary residence) to vote but Tisbury blocks that vote. How about some fairness in all of this!! The arrogance and dismissivness displayed at town meeting was appalling. The side commentary by some of the people attending in support was disgusting. And some of these people are teaching our children! Not one of these people, some of whom have just recently joined our community, who spoke in support of tearing down our town school bothered in their remarks, or after the vote was taken thought to thank the town residents for having to pay for this ugly suburban mess. Not one. They instead promptly walked out high fiving each other like they had just won the game. Unprecedentedly halting debate. Leaving residents and town officials waiting in line to speak to head back to their seats. Some of those speakers who did not get a chance to speak are pole that have invested their Whole lives in stewarding our town. Most of the speakers who spoke in favor are either working within the school system, or married to a teacher, or connected to the school in some other way. And you have to wonder, for most of the parents that spoke, and teachers too, openly admiting they did not attend the meetings, but did they attend the parallel propaganda sessions being presented for the school.. did the teachers use the students to pressure their parents to vote for this? The parents were given misinformation in order to garner their support. A NO vote on April 24th, should be a moral obligation for any long time Tisbury resident. It saddens me, that you Tisbury Voter must resort to half truths and I might suggest lies to make your point. Where are the facts regarding our teachers using students to pressure their parents. Name calling and belittling other tax payers because their beliefs are totally different than yours is disrespectful. I respectfully request you read Mrs. Silence Dogoods civic lesson. We need not divide ourselves with mean rhetoric and blame calling. It's a democratic process. A majority makes the decisions and those who show up to meetings make the plans and provide direction. Vote YES for a new school. I am consistently confused at the low voter turnouts at ANY election. What is it? YOUR VOTE MATTERS. PLEASE GO AND VOTE. In reply to raising the residential rate to 35%. I own a home in Tisbury. My son lives there with someone. I'm not going to just give him the house, but would be crippled if every resident received a 35% residential exemption. Not everyone that owns a house in Tisury, but doesn't live there, is renting it out for big bucks. Many homes have other family members in them, just not the person holding the deed. This situation is not black and white.